More than 300 schools in Michigan will join students around the country to celebrate Walk to School Day on Wednesday, October 4. Thousands of Michigan students, along with their parents, teachers, and community leaders, are expected to participate. 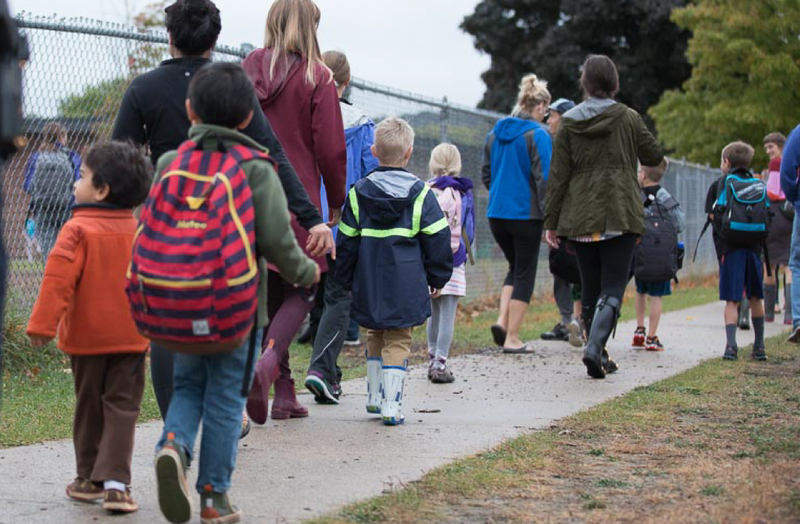 Walk to School Day encourages students to seek a lifetime of physical activity. The event takes place nationally and internationally, promoting the growth of walkable communities while helping to reduce traffic and air pollution. Walk to School Day also gives young people an opportunity to engage with their communities and build confidence. As part of the Michigan Fitness Foundation, the Michigan SRTS team partners with the Michigan Department of Transportation (MDOT) to work with schools, families, and communities across the state to enhance active transportation through a variety of modes. Federal funding for SRTS programs was established by Congress in 2005, continued under the Moving Ahead for Progress in the 21st Century Act of 2012, and again under the Fixing America’s Surface Transportation Act of 2015. MDOT’s role is to administer the federally-legislated SRTS program. The Michigan Safe Routes to School website (links to different site in new window). The Michigan Safe Routes to School Twitter feed (links to Twitter in new window). The Michigan Safe Routes to School Facebook page (links to Facebook in new window).